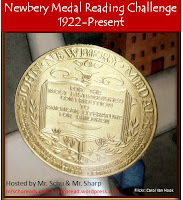 Maria's Mélange: Of Trumpets and Stars..
My “It’s Monday” posts have included some details on my Newbery Challenge progress, but it seems like it’s time to give a bit more detail on the last few books I’ve finished. The two books I’m including here celebrate both courage and the tendency of people to expand their definition of family to include the friends and neighbors that surround them. I celebrated finishing the end of the 1920s with this one. My school librarian was able to hook me up with this title. Several of the other books weren’t available in our building. I have to say this was an enjoyable read. Up until this point, I had trouble understanding why the book was selected for the award. While it’s not nearly the style of book that would win today, I actually felt some connection to the characters in this tale. The children in the story show courage and strength, and look out for one another. I didn’t need to drag myself through the story, or bribe myself with another book on my pile to finish it. There was some suspense, some mystery, and even a hint of the kind of supernatural plot elements that would appeal to the readers of today. Heck, just the tie in with the philosopher’s stone would be enough of a plug to convince some of my Harry Potter and Nicholas Flamel fans to give it a whirl. Remember when I said I was “altering the deal”? 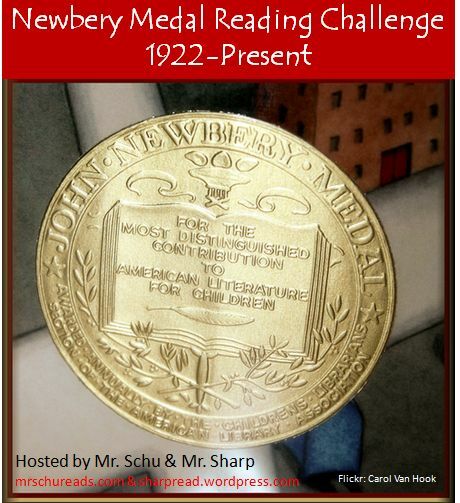 I originally planned to just count the Newbery books I read in order, starting in 1922. Yeah, that wasn’t working out for me. I decided to go ahead and count the other Newbery books I read along the way even if they weren’t in the right chronological order. I have read this book many times over the years, and I love it every time. I decided to put this one into my challenge right now because I read Hereville (a graphic novel about an Orthodox Jewish family) and I was reading the work of a friend set in Nazi Germany. With its simple structure and easy to follow language, Number the Stars packs a wallop in the emotional category. A reminder of both the best and worst parts of humanity, this book is a wonderfully accessible way to introduce kids to the horrors of our past while also emphasizing the ways that regular people fought back against the evil. I completely understand why this book won a Newbery. It is everything good literature should be. A strong story combined with lesson about life and the world that help us teach our children to be strong, capable, and loving.